When I found out that after 22 years of living, it was time to check off going to London from my bucket list. And growing up watching Jamie Oliver on the Food Network channel, has always left me wanting to dine at one of his many restaurants. 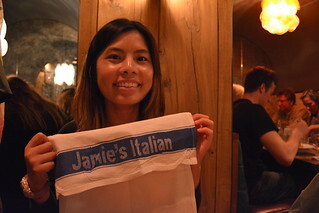 It was busy for a Monday night at Jamie’s Italian. Having made no reservations, we waited around 20 minutes for a table (not bad). We headed downstairs where there were more tables and it was definitely a full house that night. 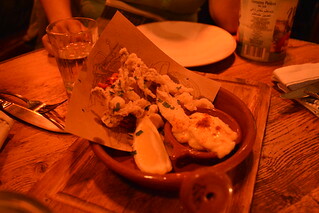 For starters, we shared an order of Crispy Squid. To be honest, I was disappointed in the size of the starter. Maybe because I’m used to the larger portions served in North America. But nevertheless, it was very delicious and crunchy. 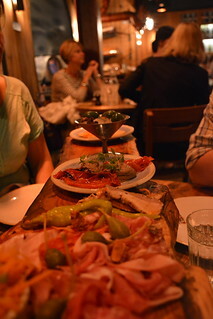 D ordered two of Jamie’s Ultimate Sharing Plank (for four of us to share). Ir basically had everything; olives, sliced meats, salsa etc. 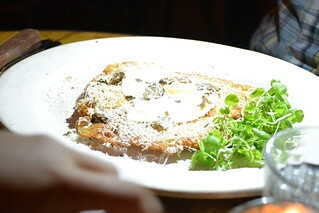 Writing this blog post makes my mouth water as I can re-taste the flavours from that night. What I loved most about the menu is that there are two different sizes of pastas you can order. Let’s say that your table ordered many starters, you could order the smaller pasta dish, cause you’ll probably be full from eating those appetizers. I was feeling spontaneous in ordering something that I wouldn’t be able to get elsewhere, so I ordered myself a small bowl of squid and mussel spaghetti. My first impressions? I couldn’t tell if the spaghetti was cooked cause the noodles were more than chewy. I’m guessing it’s the squid ink? 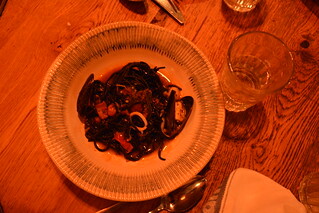 It was salty and that was understandable since it was a seafood pasta dish. 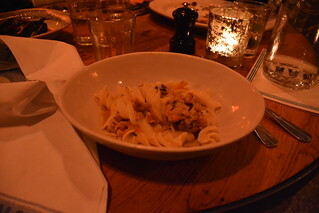 D had a rabbit ragu (again, something that you wouldn’t find at just restaurant). I think he was unimpressed (he’s not here at the moment, so I can’t ask his opinion of the dish). There wasn’t anything that he found special. Dad got a turkey milanese. I don’t remember trying a piece but I’m sure he gave me a bite of it. 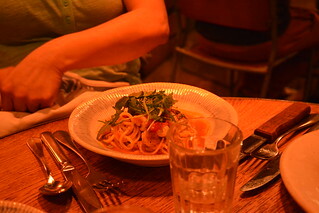 Mom had a small prawn linguine. I preferred her pasta over mine. Her choice was safe. We were all full after we ate our mains. Dad didn’t finish his, as it was a bigger portion then the rest of us. 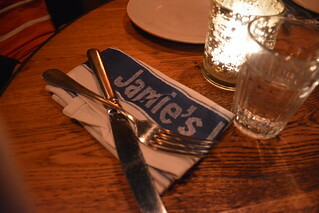 I’m still willing and for sure WANTING to try Jamie’s other restaurants. Finally I can say that I’ve been there! Click here, here, here, here, here and here to get caught up with my previous blog posts during my stay in London. I forget that this is your food blog. Because I was wondering if you did anything other than eat in London. Hehehe. Will you be blogging about non-food adventures in London? Have you forgotten about http://www.andallthethingsinbetween.wordpress.com? ?